It has never been more important for executives and office managers to implement environmental policies in their workplaces. Not only do you open your business to new avenues for cost control, but you also improve efficiency, reduce liability for environmental waste, and introduce new options to engage customers who are increasingly environmentally conscious. Creating a comprehensive, company-wide environmental policy is key to improving your environmental footprint. Otherwise, you are left with an ad-hoc collection of policies that apply exclusively to individual processes. These may help in a small way, but they fall short of the transformative power that environmental policies promise organizations. As an environmentally conscious organization, DSI is committed to helping its customers implement strategies for recycling office supplies and using office resources more efficiently. One of the most important ways we do this is by helping our customers achieve their toner recycling goals. We focus on tone recycling because it represents one of the areas where the vast majority of organizations fail to fully implement cost-effective, environmentally conscious policies. Environmental options like purchasing remanufactured toner can help organizations save money on print processes while improving output quality and efficiency. Based on the facts compiled from different sources including the Environmental Protection Agency, Clover Technology, and Earth911.org, the annual inkjet cartridge use stands at over 1.3 billion cartridges per year. That is enough discarded cartridges to circle the earth twice by stacking each cartridge atop another. If you calculate the number of inkjet cartridges thrown away per year in the United States alone and divide by the number of seconds in a year, you arrive at the alarming conclusion that American print users throw away eight ink cartridges per second. More than 70% of discarded inkjet cartridges end up in landfills. The combined weight of a year’s worth of cartridge waste in the United States is 150 million pounds. The average laser cartridge will take about 450 years to decompose in the landfill environment, but certain components will resist decomposition for more than a thousand years. Interestingly, laser printer cartridges account for 90% of discarded print cartridges the world over. Every single discarded ink cartridge contributes about one ounce in landfill waste, while larger toner cartridges contribute about 2.5 pounds of metal and plastic waste to landfills. There is no way to manufacture new toner cartridges without emitting carbon dioxide into the atmosphere. Manufacturing a single monochrome toner cartridge adds about 10 pounds of CO2 to the atmosphere – excluding the toner itself, which can contribute an additional 7 pounds of CO2 under modern manufacturing standards. Carbon dioxide is one of the best-known greenhouse gases produced by heavy industry. It accounts for 85% of global greenhouse emissions and plays a significant role in trapping heat in the planet’s atmosphere. Laser toner is essentially a dust of plastic polymers. The process of laser printing heats these polymers up so that they stick to paper in recognizable patterns – letters, images, and the like. It should come as no surprise that dumping this dust of plastic polymers in a landfill is environmentally hazardous. There are few, if any, safeguards that ensure laser toner remains in the landfill and doesn’t spread outside of its bounds into local aquifers or other environmentally important areas. Laser toner cartridges are among the easiest office supplies to recycle. Refilling the cartridges themselves is a simple mechanical process that toner remanufacturers can perform at a significantly lower cost than what it takes to produce new toner cartridges. Not only does this option represent a lower environmental cost, but it also presents a much lower consumable cost for office managers and executives who invest in environmental toner recycling. Fuser assemblies and printing drums are also recyclable laser printer components that unfortunately end up in landfills. Electronic waste represents a tiny fraction of the United States’ total landfill volume, but a disproportionately large amount of its toxic waste. Electronic items contain rare metals and other materials that should not end up in landfills. According to the United Nations, only 20% of global electronic waste generated in 2016 was actually recycled. In North America, this figure is less than 17%. DSI is an environmentally conscious technology provider that helps its customers and partners put cost-effective, value-added environmental policies in place. 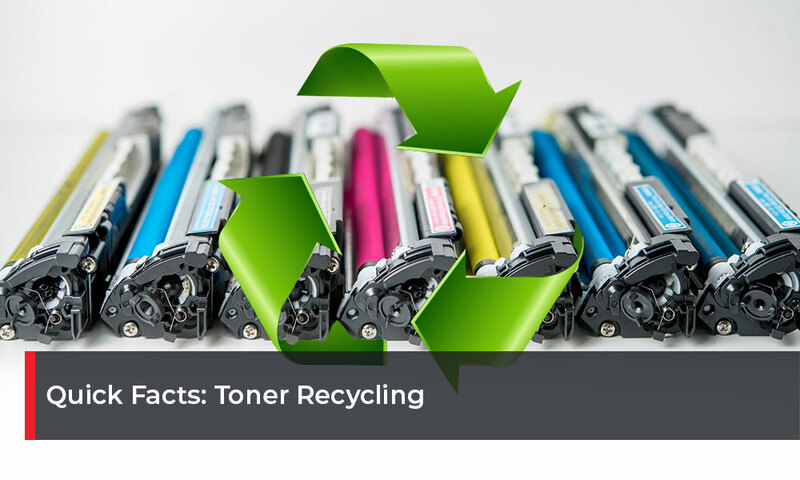 Our experts can help you establish efficient policies for toner recycling and remanufacture, and giving you options for recycling electronic waste effectively. Put your company on the right path to reducing the environmental impact of everyday processes. Talk to a DSI toner recycling expert today.